provide continuity of a wilderness corridor along the Sackville River stretching from the 102 highway at Bedford to the Pockwock Municipal Watershed. protect habitat presently functioning as an un-official wildlife corridor extending from the Bicentennial Highway at Bedford along the Sackville River to Hants County. This corridor’s viability is presently ensured by public ownership of the lands associated with Jacks Lake Regional Park, the Dept. 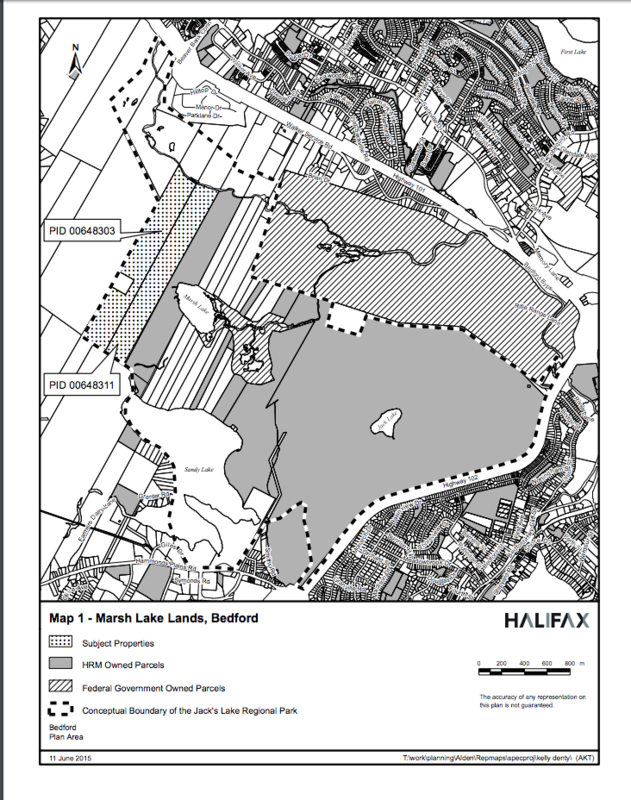 of National Defence Rifle Range, the former Sackville Landfill and the Pockwock/Tomahawk Watershed lands. The Halifax Green Network Plan, currently underway, will be recommending that this corridor be one of several key wilderness corridors penetrating into the urban area to be incorporated into land use and park planning. 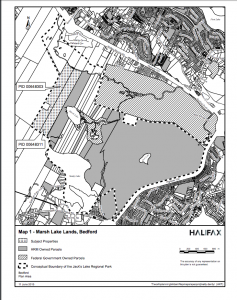 Staff has been assembling lands at Marsh Lake since 1999, first following direction set out in the former Town of Bedford’s MPS policy and then in the 2006 Regional Plan. If these lands were currently available for sale on the open market, staff would be recommending to Regional Council, independent of this request, that they be purchased using the funding from the Park Land Reserve account.